Nick lives in the Boston area where he is working towards a graduate degree in Buddhist studies. He is originally from the Karme Choling neighborhood. 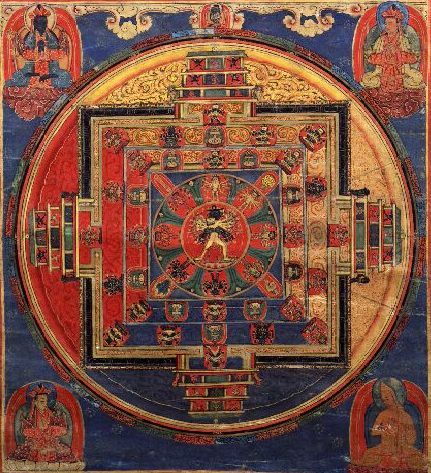 We often hear about the connection between Shambhala and the Kalachakra tradition. While the Kalachakra initiation has been given publically by teachers like His Holiness the Dalai Lama and His Holiness Penor Rinpoche, it is less common to have exposure to the Kalachakra Tantra source-material in translation. This year, I have enjoyed the good fortune of studying the Kalachakra texts as part of my graduate program in Buddhist Studies. I thought it might be interesting to share some of what I have learned about Shambhala in the Kalachakra tradition. The Kalachakra is an encyclopedic collection of vajrayana Buddhist knowledge, including material on astrology, the human body, ritual, and meditation practice. The Kalachakra tradition gained prominence in India sometime in the early 11th century, making it the last of the tantric traditions to develop in India. The Kalachakra eventually disappeared along with Buddhism in India, but flourished in the Tibetan world, where it is still studied and practiced today.